Brew Hauler Carboy Carrier - Texas Brewing Inc. The Brew Hauler Carboy Carrier was designed by a homebrewer to end the constant struggle with handling and moving heavy and wet glass carboys. 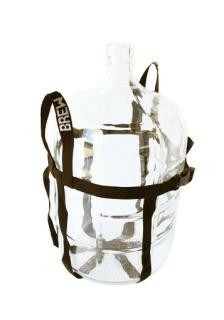 Constructed of polypropylene webbing, it creates a safe handle to transfer 5, 6 and 7 gallon glass homebrew carboys.